A young woman’s death after heavy snow caused a roof collapse in Weymouth has officials warning the public to watch out for their homes. On Thursday, a 29-year-old woman was killed when a carport collapsed on her. The woman was talking on the phone while sitting on the porch steps of a Harlem Road home. The Massachusetts Emergency Management Agency (MEMA) has issued a warning for the public to clear off their home roofs and storm drains in their neighborhoods to minimize flooding problems. While we expect snow in Massachusetts, it has challenged drivers and caused numerous school day cancellations this season. Piles of snow have hampered visibility. Drivers are navigating a maze of snow-packed and slushy roads along with dangerous potholes and, which are starting to appear in the melting. In addition to the Weymouth woman’s death, a barn collapse in Framingham killed three cows and injured four others this week. At the Burlington Mall, a water main break trapped a vehicle in a large sinkhole. The mall was closed but expected to re-open today. It may seem like a record-setting season, but not this year. Yes, we are already 25 inches above the average season’s snowfall. But earlier this week (before the snowfall) the Boston Herald reported that while Boston had seen 53.5 inches, 1995-1996 was the record snow year, with 107.6 inches. The National Weather Service has predicted this season will not even make the top 10 list for heaviest snowfalls. 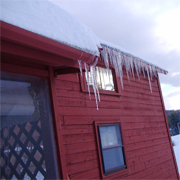 When snow piles up, some roofs are vulnerable to collapse, especially when there are numerous snow storms combined with rain and overnight melting. Flat commercial roofs are at the greatest risk. This year, while the snow may not appear that deep, some of the storms have dumped heavy wet snow, and that has been followed by soaking rains. The loads are immense. How to remove snow from a roof is a challenge. Homeowners can attempt to clear it themselves with a snow rake, which can be purchased at most hardware stores. But you should never use a snow rake from a roof. You should clear the snow from the ground to avoid the risk of slipping and falling and head injuries. Unless you are experienced, avoid ladders, which can be extremely slippery. The other thing to know is that metal snow rakes can conduct electricity if they come into contact with a power line. Often by this time of year, a roof may require a professional treatment because of repeated snow storms and winter freezing. If that is the case, call someone who is experienced and insured for this type of work. They should be insured in case they damage your home, and they should also carry worker’s compensation insurance for their employees. You have the right to ask for proof of insurance, and you should. Finally, do take some time to shovel your walks and your stairs. It the safe and the neighborly thing to do.